Tesla was founded in 2003 by Martin Eberhard and Marc Tarpenning; two engineers who wanted to prove that electric vehicles can be better, quicker and more fun to drive than gasoline cars. They named the automobile company after the Physicist, Nikola Tesla. In February of 2004 they brought on Elon Musk to be the Board Chairman. Musk was primarily responsible for acquiring a bulk of the financing from 2004 to 2007; to the tune of approximately 60.5 million (Kumparak & Burns, 2015). In July of 2005 Tesla signed a production contract for Lotus to manufacture complete cars minus the powertrain for what would become the Tesla Roadster, it’s first model car. July 19, 2006 – in Santa Monica, CA, Tesla’s first vehicle off production is unveiled, making Tesla an official automobile company. The year 2008 brought major changes in leadership; Musk becomes CEO of Tesla, investing over 70 million of his own money into the business, on January 7 Eberhard steps down from the board of directors and the advisory committee and strictly becomes a stakeholder in the company, Tarpenning also resigns from the company this year. 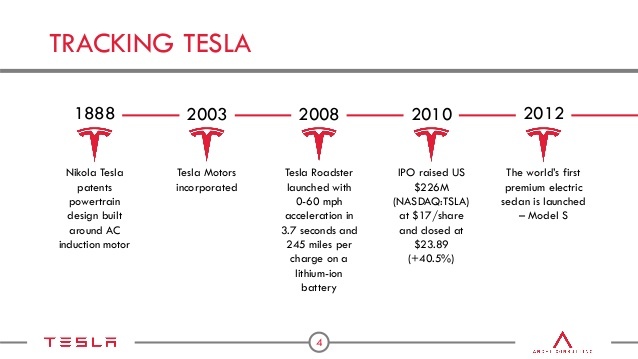 Tesla has grown as a company in its’ short life span. Tesla designed the world’s first ever premium all-electric sedan from the ground up – Model S. The company now has 265 showrooms and charging stations in the U.S, Europe, and Asia. The organization currently employs over 14,000 people in sales, production, and other administrative roles. Its’ production and manufacturing base is in Freemont California. Tesla is no longer just an automaker; Tesla also manufactures the Tesla Powerwall, Powerpack batteries, solar panels and solar roof tiles. On August 1, 2016, Tesla purchased Solar City Corp for $2.6 billion in stock. SolarCity is the largest installer of rooftop solar systems in the United States (Tesla.com, 2017). “Tesla has awards, zero emissions, brilliant leadership and downright cool cars. But it lacks the one thing its investors want: a profit — from selling cars” (Weinstein, 2013). Investors have been patiently waiting for a big payoff year, but it doesn’t seem likely if Tesla continues the same business practices as previous years. The new Tesla Model 3 is giving shareholders a glimpse of hope. The Model 3 is Tesla’s answer to the affordable luxury electric car which starts at $32,000 for a base model. The Model 3 was slated to be the turning point for future growth, but there is already trouble in the horizon because of low production, manufacturing costs, and sales. To avoid a financial crisis Tesla must sale more cars. To do this they need to grow its network of retail and service centers (fewer than 100 locations in 24 states), revise its’ current marketing strategy, and invest funds in advertising. Currently Tesla sales to directly to consumers without marketing, advertising, or using franchised dealers. Every bit of Tesla’s marketing strategy is built around “word of mouth”. This method may work for consumers in the market for luxury cars; however, as a marketing consultant I would build a target marketing strategy that would reach consumers in the median income range to boost sales of the Tesla Model 3. The “average” person just doesn’t know enough about electric vehicles (EV) to commit to buying one. Tesla could lead the charge in EV enlightenment. Socioculturally, people are diverting more and more towards living the green way of life which includes diversion to EVs as well, hence positivity for Tesla (Aulicino, Waratuke, Williams, & Elliott, n.d.). Legally, Nations are committing themselves to lay down new rules on GHG, Emissions etc which lead to day by day increase in fuel prices leading to diversion to EVs as well. (Aulicino, Waratuke, Williams, &Elliott, n.d.). Economically, Green transportation is being globally promoted to decrease the burden on natural resources, as increased number of vehicles is causing a burden and the fuel prices are rising subsequently. (Aulicino, Waratuke, Williams, & Elliott, n.d.). Technologically, Lower prices and higher quality products have been enabled as a result of tactical investors by increasing EV battery lifetime. (Aulicino, Waratuke, Williams, & Elliott, n.d.). Globally, International alliances around the globe will emerge into economies lowering the prices of green technologies. (Aulicino, Waratuke, Williams, & Elliott, n.d.). Physically, the continuous rising of demands in automobiles, green protection and technologies will result in positivity for EV’s. (Aulicino, Waratuke, Williams, & Elliott, n.d.). To create the analytical framework Michael Porter’s Five Forces Model has been currently utilized. Competitive Rivalry: (Lehman, 2009) says that the lack of EV manufactures in the market results in a very low competitiveness. The battery technology is where the competition can be tough for Tesla;. Meanwhile lithium-sulfide batteries are supposed to be extra sustainable than lithium-ion ones (Bullis,2012). The Model 3, is designed after the inception to create increased production in mind to sellout cars out quickly. Tesla has already been selling out pricey model sedans S and X with a initial rate of $80,000. Buyer Power: Tesla has the capability to justify the necessities of a normal and premium car as a stable combination in the EV market. Lehman (2009) said that the negotiating control of buyers will considerably heighten from high to low if the industry grows in an increasing rate. According to Tesla, Model 3 s battery was designed to travel for 220 miles with the availability of Superchargers at Tesla Stations in the next three years. Supplier Power: Tesla purchases Li-ion cells from battery companies that have lw bargaining power. Only Chassis/Engineering (Lotus) is one that has high bargaining power. Magna held high power as well but since Tesla has started in- house production it has lost its grade. Treat of Entry: For (Lehman, 2009), both the power and oil industries are relative to the EV industry. The power industry is interested in the idea as EVS will sell more power but not the oil industry as in feels insecure. Meanwhile (Aulicino, Waratuke,Williams, and Elliott, n.d.) concludes that the other mass production manufacturers and other luxury or boutique manufacturers with disrupting technologies shall have high power, in comparison to those who have similar technologies with EVs (Hall, 2013). Immediate; the direct competitors maybe luxury brands, hybrids that are successful and others that are not intended for luxury or enjoyment. Some to be mentioned are; Think, Fisker, BMW, Ferrari, Toyota and Smart. Impending: would be potential competitors as well a competitors because of joint contracts signed with Tesla for production of small components for EVs for example Hyundai, Ford and Honda. Up till now has not reached noteworthy profitability. Stock price is expected to rise from the current. Tesla has over $400 million of substantial assets. The assembling Tesla factory in Fremont, California which accommodates currently Model S has future plans to be expanded for Model 3 production. (Tesla Motors, Inc. Model S n.d). R&D of EV Components: Tesla is famous for their battery technology which was the result of their long and hard research on a very basic idea that Li-ion batteries used in laptops can be used also to drive an attractive eco friendly car (Boyke, Cheng, Clevers, Schroeder, & Strupp, 2010, p. 3). Ability to Envision the Growth of the EV: The CEO Elon Musk of Tesla is a person behind Tesla his honesty and dedication towards the company has proven to be behnd the success of the company. (Boyke, Cheng, Clevers, Schroeder, &Strupp, 2010). The company stands out of all others because of the perfect blend of ambience they create with the vehicles being environment friendly and bearing a close resemblance to any normal car. (Boyke, Cheng, Clevers, Schroeder, & Strupp,2010). Since the very beginning the company has invested most in R&D which is very obvious in their financial statement thus making very obvious their excellence in R&D. (Journal, 2014). Finally, Tesla has been busy building a network of charging stations across the world to ensure its customers for long and comfortable drives which started in 2012 for Model S. it has been announced in June 2013 to update all stations into Teslastations to provide all services and maintenance for more models to come, (Tesla Motors, Inc. Model S, n.d). Boyke, D., Cheng, J., Clevers, J., Schroeder, M., & Strupp, K. (2010). Teslatomorrow: The future of Tesla motors. University of Wisconsin-Madison. Bullis, K. (2013). “How improved batteries will make electric vehicles competitive.” Technology Review 116(1): 19-20. Doole, I., & Lowe, R. (2008). International marketing strategy: Analysis, development and implementation. Seng Lee Pres. Hall, J. (2013). /electronics/articles/tesla-builds-supply-chain-own-image/ Retrieved from http://www.mypurchasingcenter.com. Witt, D. (2013). Tesla motors presentation. TESLA (TSLA) MOTORS STATMENT F INCOME FY14, FY15,FY16.